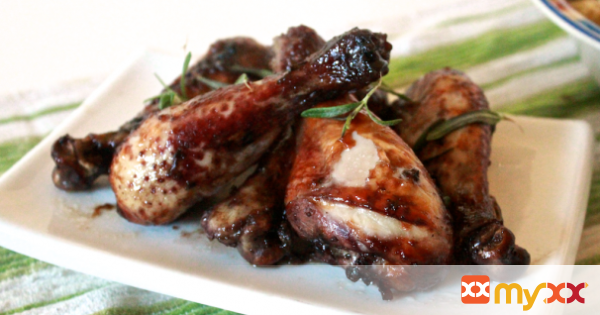 These sweet and tangy drumsticks are simple enough for a hectic weeknight meal, but tasty enough to serve to company. 1. Place blackberries, butter, water, rosemary, sugar and vinegar in a small saucepan. 2. Cook over medium high heat stirring occasionally until slightly reduced. About 10 -15 minutes. 3. Remove from heat and stir in mustard and salt and pepper. 4. Leave marinade to cool. 6. Pour cooled marinade over top and seal. Toss to coat. 7. Place mixture in the fridge and marinate for 24 hours. 9. Arrange drumsticks on a cookie sheet coated in tin foil. 10. Cook for 25 minutes, turning once. 11. Serve hot with preferred side.